Insurance is a gambling term that typically refers to a form of side bet. Generally, the purpose of this side bet is to minimize the potential loss or "hedge the bet." Insurance often minimizes risk at the cost of potential winnings. 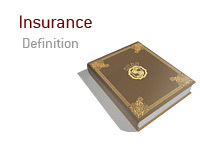 The concept of insurance, in regard to gambling, is most commonly associated with the game of blackjack. In blackjack, insurance is a special bet that the dealer offers to the player when a particular situation arises. When a blackjack dealer turns up an Ace, he offers insurance. The player accepts the insurance bet by betting up to half the original bet for that hand. If the dealer has a natural 21, then the player wins the side bet at 2:1 odds. Consider a $20 losing blackjack bet: The dealer shows an Ace, and the player takes the insurance at $10. If the dealer has a natural 21, the player wins $20 (2:1 = 2 x $10), which offsets the $20 they lost on the original wager. A similar concept exists in the game of poker. In poker, an insurance bet is a side bet between players at the table but known to the dealer. In the typical scenario, an insurance bet in poker protects the player against a bad beat. Consider a scenario where a player has gone all-in with a strong hand against a larger stack. A bad beat means that the small stack is out of the game, so an insurance bet prevents that from happening at the cost of overall winnings. In poker, an insurance bet typically occurs between one player in the hand and one who is not. Numerous high-profile examples of insurance bets in poker have taken place during the WSOP Main Event final table.